Weston & Sampson understands the issues associated with environmental remediation, risk assessment, and property redevelopment, and has years of experience working with several classes of contaminants found in various environmental media. Our specialists review site-specific data to select effective strategies to meet the goals of our client and regulatory requirements while evaluating remedial technologies for system effectiveness, duration of cleanup, and cost. Our professionals include engineers of various disciplines (environmental, chemical, geotechnical, and water resource), geologists, hydrogeologists, scientists, and wetlands and permitting specialists. We have designed and implemented numerous groundwater recovery and treatment systems. Our proven planning methods allow us to provide cost savings, significantly reduce construction delays, minimize health and safety risks, and ensure timely document submission. Many of our clients have benefited from our ability to maintain project schedules despite encountering hazardous materials during construction and to design innovative solutions that reduce regulatory reporting requirements. PFAS in Biosolids and Sludges- On March 22, 2019, Maine DEP issued a memorandum requiring all biosolids handling facilities sample for PFAS by May 7, 2019. Given the aggressive schedule, you may have questions. We can assist you. Addressing Emerging Contaminants in Drinking Water- Managers of drinking water sources across the country are finding the emerging contaminants PFCs above EPA and individual state health advisory levels. 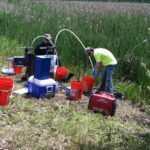 Weston & Sampson has experience assessing and remediating PFASs in drinking water in many locations.